According to the National Wellness Institute, wellness is defined as, “An active process through which people become aware of, and make choices toward, a more successful existence.” As human resource professionals, we’re always looking for new ways to enhance the company we work for. If you are looking to successfully serve and help the employees working within your organizations, a holistic corporate wellness program could be the answer. I’m Meredith Baciak and I’m the wellness coordinator at Miron Construction Co., Inc., a construction company headquartered in Neenah, Wisconsin. Leadership at Miron has made the health and wellbeing of employees a priority by creating an employee self-care program, offering a holistic approach to the traditional wellness program which typically focuses solely on physical health. My job is to help people become healthy and happy at work, which will hopefully influence their wellbeing in their personal lives as well. I work directly with employees to guide them in developing and reaching their personal goals and to help them become the healthiest version of themselves through relationship building, motivation, and positivity. Occupational wellness focuses on creating a healthy work environment that minimizes stress, increases comfort, and encourages healthy behaviors such as proper nutrition and exercise/movement. This also encompasses leadership supporting investment in career development and enabling employees to recognize the value and importance of the work they do. Intellectual wellness emphasizes education and promotes skill development in areas that include critical career skills, personal skills, and lifestyle skills. Emotional wellness centers on emotional intelligence and feeling good about one’s priorities. The organizational culture, supported by corporate policy, needs to promote work-life balance, ensuring employees properly manage time for work, family, and personal and volunteer activities. Spiritual wellness goes hand-in-hand with emotional wellness, focusing on the importance of human life, the community, and the environment/planet. Social wellness emphasizes creating and maintaining strong, healthy personal and professional relationships. Physical wellness focuses on a person’s physical body, where “health” is determined by physical fitness/activity, sleep quality, nourishment, hydration, genetics, disabilities, and illness. Financial wellness equates to financial security. From the workplace perspective, this means providing financial programs, resources, and tools to enable employees to make sound, secure, financial decisions today and in the future. Recently we implemented myInertia, a program that utilizes fitness devices to track activity and creates personal accountability and competition between offices. For successful employee adoption, you must be able to prove that your program works and has a positive impact on the working environment. That’s why we utilize a program like myInertia, because it provides measurable and quantitative data. Implementing a wellness program doesn’t happen overnight; it’s developed from the top down. If management and leadership staff aren’t supportive, chances are the program will fail. For example, employee survey results helped me discover that people were having a difficult time finding opportunities to fit a workout in during the workday. Our leadership team now allows employees to take their hour-long lunch break any time of day. This allows employees the flexibility to utilize the wellness space for a workout session in the morning or afternoon and take advantage of a working lunch. The employees who utilize Miron’s wellness programs are physically healthier, which in turn creates lower insurance costs for the company, less absenteeism, and increased work productivity. Participating employees have also shared the enhancements they’re seeing in their emotional health; they’re feeling less stressed, less overwhelmed, and less disconnected. When a person applies the seven dimensions of wellness to their life, they become aware of the interconnectedness of each dimension, experiencing a “total” optimal healthy lifestyle. I’m very blessed to be in a position where I can help build relationships and guide people toward being the best versions of themselves through self-care. Building a holistic corporate wellness program is beneficial to an organization because it truly brings out the best in employees, making for a healthier and happier workplace. 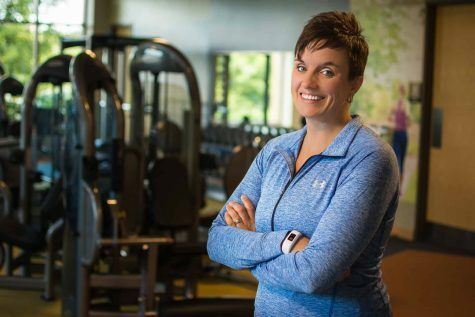 Meredith Baciak has an extensive background in exercise and sports management, as well as a degree in exercise science and sports studies. She has been an instrumental part of multiple corporate wellness programs and now serves as the wellness coordinator at Miron Construction Co., Inc. In her role as wellness coordinator, Meredith is responsible for the overall management and implementation of Miron’s workplace wellness initiatives. Did you enjoy what you just read? If so, sign up for our e-newsletter to receive the latest information on industry trends, Miron projects, and so much more. This article originally appeared on hr.com.